This is a 'universal' quadrant, capable of carrying out mathematical, astronomical, astrological and military calculations. 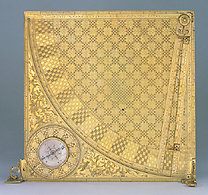 The work of Tobias Volckmer of Brunswick, goldsmith to the house of Saxony, the instrument consists of a quadrant engraved on both sides. It is elegantly decorated, and the lines are drawn with such precision as to yield results even today with only a small margin of error. The instrument is provided with a compass, which could be easily installed or removed, and which is itself provided with a lid which works as a sun and moon dial. A Jacob's staff with a movable cursor and a tripod also belonged to the instrument, which was brought from Germany by Prince Mattias de' Medici in 1635.